← No camping for us…. 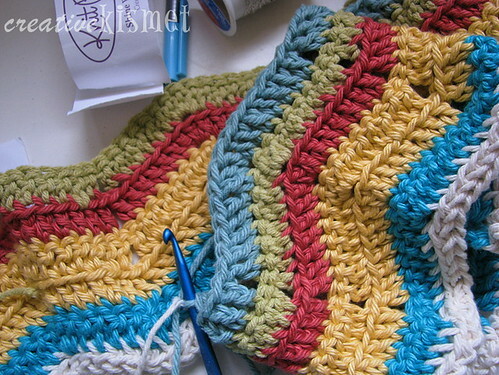 I’ve been wanting to make one of these crocheted ripple blankets for ages!! I finally figured it out and have managed 5 whole rows. It’s kinda smallish, but big enough to place on my lap, or around my shoulders. It won’t be finished until it gets cold again next year (hopefully). I finished up my patchwork swap stuff yesterday and sent it off today. Can’t wait to show you what I made. I’ll have to wait until the recipient receives it first. I haven’t crocheted in such a long time! what is the pattern? Oh wow, look at you go! Looks fantastic, love the colors. Is that cotton? I love it – ripples are such fun! This is a good time to start a big crochet project. By the time it gets large enough to cover your lap, it’ll be getting cool again! Nice timing, lady! I didn’t use a pattern, I watched a video on youtube. I’m no good at patterns. I found a few, but some of the terms threw me off. I need to learn how to read patterns better. It is all cotton, btw.